Give your fleet of cars the proper cleaning that they deserve with high quality car care cleaning rags. TIDDOX's environmentally friendly COLOURED T-SHIRT RAGS may be recycled, but that does not mean they are made of low quality material. We ensure that our carefully selected t-shirt rags undergo an intensive cleaning process and metal detection test before they are processed and packaged for our customers. Highly absorbent, cotton-soft, and non-abrasive - these are the perfect car cleaning rags! Metal detection ensures that when detailing the cars they won't accidently be scratched by a stray zipper or button. The rags are washed in giant laundromats to make sure that they are clean and hygienic, ridding them of any unpleasant stains or odours. The cotton textiles are soft, absorbent and low linting so they are ideal for car polishing tasks, such as washing and drying vehicles. 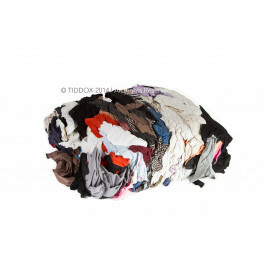 TIDDOX's RECYCLED COTTON T-SHIRTS do a great job at cleaning, drying, and polishing! They are safe and gentle to use, and economically packaged in 10kg and smaller portable 5 kg bags. So, if you're looking for an economical rag solution, TIDDOX offers fleet owners, car detailing organisations, valeting business and car wash companies a professional wiping solution with its high quality cleaning rags that are thoroughly tested and still price competitive! Quality without any compromise to ensure that our car cleaning customers get consistent quality product and value for money! Other related products from TIDDOX 's range of car care rags, wipes and cloths include the RAG-ON-A-ROLL, the LOW LINT INDUSTRO WIPES and the SHAMMY WASH CLOTH.